There are plenty of foods which are high in iron. However, just because you are eating iron foods, it doesn’t mean your body is absorbing all the iron. Bioavailability refers to how well our body is able to absorb a certain nutrient. Many iron foods have a low bioavailability, but there are simple tricks you can do to increase iron absorption. Phytic Acid: High amounts found in seeds and whole grains. Oxalic Acid: High amounts found in dark leafy greens, chocolate, tea, coffee, and some berries. Polyphenols: High amounts found in soy, peanuts, whole grains, tea, and many fruits and vegetables. Spinach, for example, is often cited as one of the best vegetarian sources of iron. But, because spinach is high in oxalic acid, we probably absorb less than 10% of the iron in spinach. With bioavailability taken into consideration, here are the real best vegan sources of iron. *The amount of iron listed in milligrams doesn’t represent the amount which your body will actually absorb! * Soaking and sprouting are both ways to reduce the phytic acid levels in foods. If you were to soak/sprout beans or seeds before eating them, they would become much better vegetarian sources of iron. TIP: Add a splash of lemon juice or apple cider vinegar to the soaking water of your beans, grains or seeds. This breaks down phytic acid!!! Note: Spirulina also binds to iron and will cause excess amounts to be excreted. So do not take spirulina at the same time as your iron supplement! Dietary iron can be broken down into two types: heme iron and non-heme iron. Heme iron is only found in animals whereas vegetarian foods only contain non-heme iron. It is important to note, however, that about 60% of the iron from animal sources is actually non-heme iron. Both heme and non-heme iron get absorbed in the intestines, but through completely different mechanisms (which are not fully understood). The body is able to absorb heme iron much more efficiently than non-heme iron. This is bad news for vegetarians and vegans who primarily get their iron from plants, which is why anemia can be a concern for people on a plant-based diet. The Office of Dietary Supplements puts the absorption of heme iron at about 15-35% compared to just 2-20% for non-heme iron. Not only is heme iron better absorbed by our bodies, but its absorption isn’t as influenced by antinutrients (like the iron blockers listed below). The absorption of heme iron also isn’t as affected by the body’s need for iron: the body will continue to absorb heme iron regardless of how much iron is needed. This is an issue because you could overdose on animal-based heme iron, but won’t overdose with plant-based non-heme iron. The absorption of non-heme iron is much better controlled, and absorption increases when there is a need. For example, pregnant women (who need much higher levels of iron to support the growing fetus) experience increases in iron absorption by as much as 60%. This has led many researchers to conclude that vegetarians may compensate for their low-iron diets by absorbing the mineral better. Phytic Acid: Indigestible to animals, this natural chemical binds to metals, thus making them indigestible as well. Along with negatively impacting iron absorption, phytic acid also blocks zinc, calcium, and magnesium absorption. Seeds and bran contain high amounts of phytic acid. Oxalic Acid: This natural chemical is actually poisonous to the body. It has gotten a bad rap for speeding up bone degradation and tooth decay, causing kidney stones, and blocking the absorption of iron and calcium. Foods which contain high amounts of oxalic acid include dark, leafy greens, chocolate, tea, coffee, and some berries. This is why spinach isn’t a good source of iron, even though it contains lots of iron. Polyphenols: Polyphenols are a type of antioxidant. They can do wonders for your body – like preventing oxidation and fighting cancer. However, they are not helpful when it comes to non-heme iron absorption. Polyphenols bind with iron in the intestines, preventing the mineral from getting absorbed and causing it to pass out as waste instead. Tea (especially black tea), coffee, and chocolate have high levels of polyphenols. In one study, it was found that coffee (rich in polyphenols and oxalic acid) can block iron absorption by as much as 60%. Another study found that phytates can reduce iron absorption by as much as 65%. While studies do overwhelmingly show that these substances block iron absorption, it is impossible to tell exactly how much iron is getting blocked and how much is getting absorbed. Aside from bodily differences in individuals, there are also the aspects about the foods we eat which can impact absorption. For example, plants which are grown with high-phosphate fertilizers will have higher phytic acid levels than those grown with natural compost. Age of the plant also affects composition as well, with younger plants having lower levels. Certain food preparation methods can decrease the amount of oxalic and/or phytic acid in foods, thus making the iron in them more absorbable. According to the Weston A. Price Foundation, the best way to reduce phytates in beans is to sprout them and then cook them. They found that soaking beans at moderate temperatures for 12 hours results in an 8-20% reduction in phytates. Beans fermented for 18 hours had a 50% reduction in phytates. Lentils which were soaked for 12 hours, germinated for 3-4 days and then fermented were likely to have had all their phytates removed. Tip: Add a splash of lemon juice or apple cider vinegar to beans/legumes while they are soaking; it will help reduce the level of phytic acid! While some natural chemicals in plant foods may block iron absorption, there are also some which increase iron absorption. 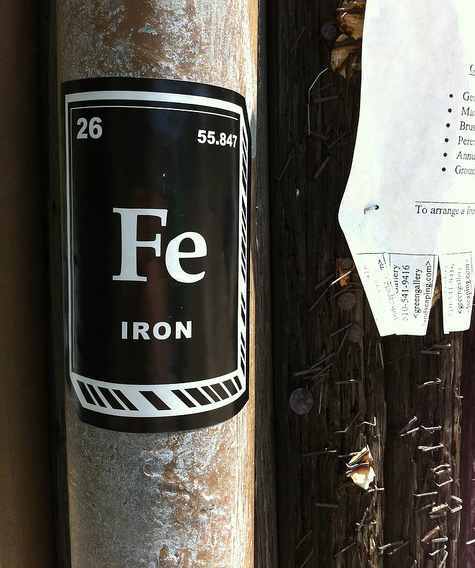 The most notable of these is vitamin C. Vitamin C helps iron convert from Fe3+ (ferric iron) to the more absorbable form Fe2+ (ferrous iron). Studies have shown that consuming as little as 50 mg of vitamin C with a meal can increase iron absorption by as much as 600%. One easy way to increase iron absorption is to put some fresh lemon juice, which is rich in vitamin C, in your water during meals (also is great for boosting immunity). Other natural substances which increase iron absorption include vitamin A and beta carotene. These are typically found in brightly-colored foods like tomatoes, carrots, squash, and peppers, so add some color to your meals to increase iron absorption. The good news for people on plant-based diets is that their diets are often high in these iron-boosting foods, thus helping to cancel out the negative effects of iron blocking antinutrients and the low bioavailability of plant iron. Should You Be Worried about Iron Bioavailability? It is good to be educated about nutrition and food chemistry. However, most people probably don’t need to worry about the bioavailability of iron (nor the bioavailability of other nutrients for that matter). Instead, what we should be focusing on is eating a well-balanced diet which contains a wide variety of nutrient-rich foods. Chemicals in vegetarian sources of iron may block absorption, but vegetarian foods often contain other chemicals which improve absorption too. For example, I don’t know many vegetarians who eat spinach by itself. Instead, they might prepare it with chick peas (another good source of iron) and tomato sauce (high in absorption-increasing vitamin C). Even if iron absorption is getting blocked, the meal still contains a significant amount of iron which is getting absorbed thanks to the vitamin C.
So, should you worry about iron bioavailability? The answer is simple: go get a blood test to see if your iron levels are low. If not, then keep up your current diet. If they are low, then talk to your nutritionist about how to plan meals which include bioavailable iron. It is always best to get your nutrients from food first. But, if you really think you aren’t getting enough iron, here are some of my favorite vegan iron supplements. I like the Garden of Life iron best because it is raw, but the other two options are also good, especially for people on a low budget. You can also check out our chart of the best vegan vitamins which includes some vegan multivitamins with iron.